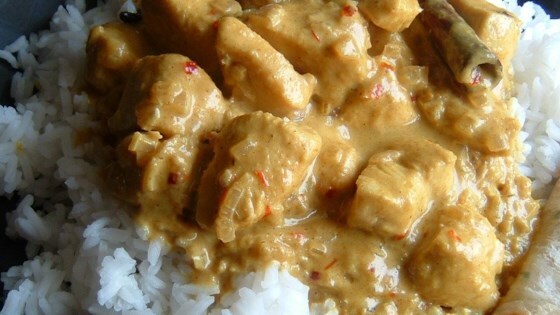 "This chicken curry recipe is totally diner style. The chicken thighs make it very soft and melt in your mouth! It's so easy to make too. Serve with rice, puri, naan or chappathi." Heat oil in a small pot over medium heat. Add chicken, onion, and ginger garlic paste. Season with curry powder, cinnamon stick, cardamom pods, bay leaves, cloves, red pepper flakes, black peppercorns, and coriander seeds. Cover, and simmer for about 30 minutes, stirring occasionally. At this point, gravy will be runny; if you want to thicken, remove lid, and cook until liquid is reduced. Great recipe and a sure winner. Recommended modifications: use fresh cilantro and add coconut milk (lite or regular) and chicken bouillion for additional flavour. Enjoy! Better than the Indian Restaurants! Great Recipe!